Is it a disgrace to be Born a Chinese? In September of 1884, San Francisco residents Joseph and Mary Tape did something seemingly quite ordinary: they attempted to enroll their 8-year-old daughter, Mamie, at Spring Valley School, a local school also to be attended by Mamie’s friends. 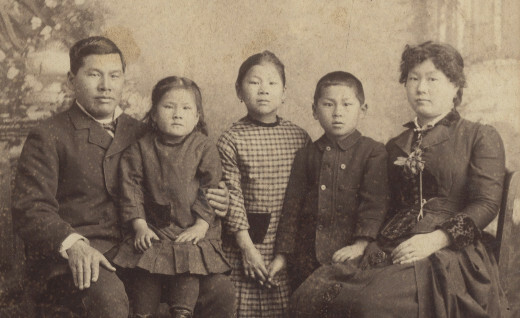 However, this was 1884, and although born in the U.S., Mamie was of Chinese descent and the daughter of immigrants—as a result, she was quickly denied entry by the school’s principal, Jennie Hurley. Furious, the Tapes took the untested route of suing the school board, and, against all odds, won. Despite the decision, the school board then temporarily circumvented what was a groundbreaking ruling by establishing a separate school for local Chinese children, Mamie Tape included. Progress continued to be slow and painful. In April of 1885, as the local authorities continued to duck and dive, Mamie’s mother wrote the school board a letter. San Francisco, April 8, 1885. I see that you are going to make all sorts of excuses to keep my child out off the Public schools. Dear sirs, Will you please to tell me! Is it a disgrace to be Born a Chinese? Didn't God make us all!!! What right have you to bar my children out of the school because she is a chinese Decend. They is no other worldly reason that you could keep her out, except that. I suppose, you all goes to churches on Sundays! Do you call that a Christian act to compell my little children to go so far to a school that is made in purpose for them. My children don't dress like the other Chinese. They look just as phunny amongst them as the Chinese dress in Chinese look amongst you Caucasians. Besides, if I had any wish to send them to a chinese school I could have sent them two years ago without going to all this trouble. You have expended a lot of the Public money foolishly, all because of a one poor little Child. Her playmates is all Caucasians ever since she could toddle around. If she is good enough to play with them! Then is she not good enough to be in the same room and studie with them? You had better come and see for yourselves. See if the Tape's is not same as other Caucasians, except in features. It seems no matter how a Chinese may live and dress so long as you know they Chinese. Then they are hated as one. There is not any right or justice for them. You have seen my husband and child. You told him it wasn't Mamie Tape you object to. If it were not Mamie Tape you object to, then why didn't you let her attend the school nearest her home! Instead of first making one pretense Then another pretense of some kind to keep her out? It seems to me Mr. Moulder has a grudge against this Eight-year-old Mamie Tape. I know they is no other child I mean Chinese child! care to go to your public Chinese school. May you Mr. Moulder, never be persecuted like the way you have persecuted little Mamie Tape. Mamie Tape will never attend any of the Chinese schools of your making! Never!!! I will let the world see sir What justice there is When it is govern by the Race prejudice men! Just because she is of the Chinese decend, not because she don't dress like you because she does. Just because she is decended of Chinese parents I guess she is more of a American then a good many of you that is going to prewent her being Educated.